As the industry waits with baited breath for reliance Jio to create the landmark disruption, there has been an uproar over VoLTE i.e Voice service over LTE spectrum. Reliance Jio paid Rs 1,658-crore fee to the government for supporting 4G VoLTE on its universal services licence. VoLTE was the final piece that would complete Reliance Jio’s portfolio of services. However is that really a disruptor as it is purported to be? Voice Telephony on LTE is made possible through apps such as Skype. However, with prohibitive CAPEX on full carpet area coverage – Data connectivity in a wide carpet area will be patchy at best. It means no voice calls when driving or outside city limits. The 2,300 MHz spectrum, is one of the worst when it comes to creating a large area network. Compared to a GSM/HSPA 900 MHz; LTE on 2300MHz requires exponentially higher number of towers in one shot. Voice is not profitable enough, to support such high infrastructure costs. Thirdly, Voice requires a better quality of experience. A data subscriber rarely notices fluctuations in speed, but a user in a moving vehicle will expect the same call quality throughout. Thus, for data services can afford lower initial investments and expand incrementally afterward, but for voice telephony, all investments are needed up front. The one way VoLTE might make commercial sense is if Reliance acquires or partners with an existing mobile operator, such that its current 2G or 3G network becomes the fallback network that will carry voice calls or data when 4G airwaves aren’t around. That appears to be the only way Voice can happen for Reliance Jio. (Or alternatively, a tie up with Reliance (Anil Ambani) could provide Mukesh Ambani the where with all to su[pport voicee services). Thus VoLTE under the current understanding is not the disruption as many earlier thought it to be. Total number of net adds for Q4, 2012 accounted 140 million. In terms of new subs/net adds, China leads the fray with 30 mln subs, followed by India (11 mln), Bangladesh (9mln), Indonesia (8 mln) and Nigeria (5mln). 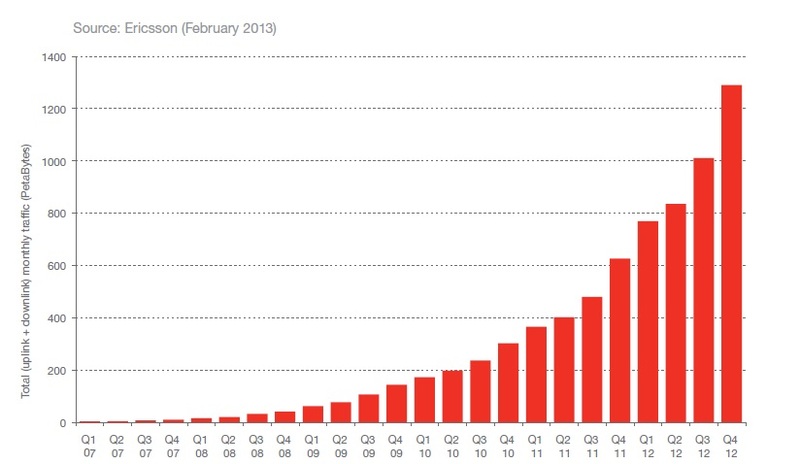 In Q4, mobile broadband subscriptions1 grew ~125 million to 1.5 billion, reflecting a 50% year-on-year increase. GSM/GPRS/EDGE subscriptions grew ~44 million and WCDMA/HSPA grew ~70 million. Together these technologies represent ~80 percent of total net additions. 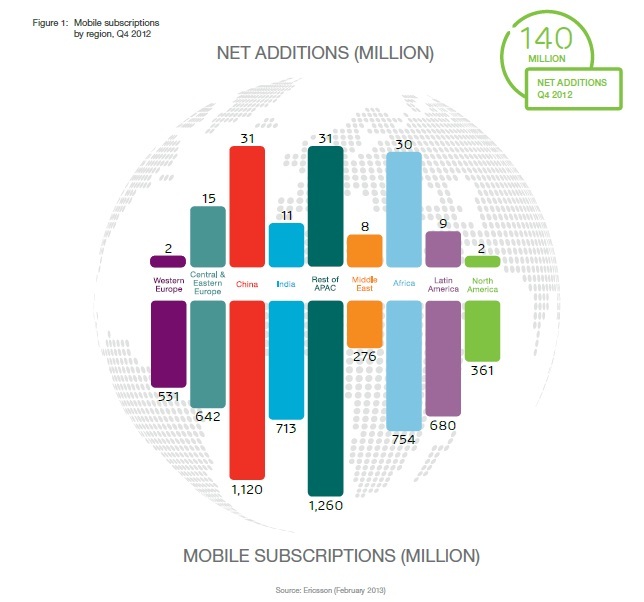 LTE subscriptions grew from 14 million to 57 million. 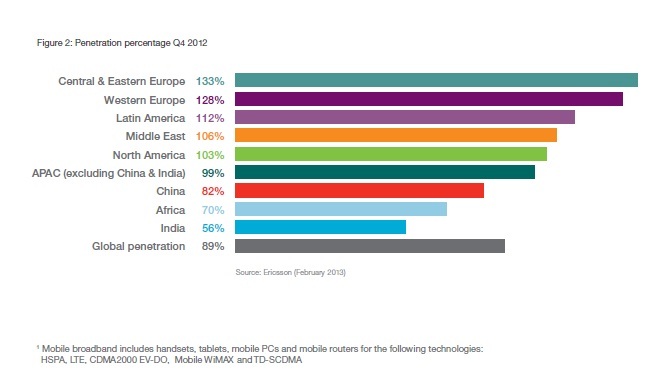 GSM/GPRS/EDGE + WCDMA/HSPA + LTE accounted for 90% of the global mobile net adds. World wide data traffic continues a healthy uptrend and shows significant and stable growth. Data traffic has doubled Q-o-Q Q4, 2012 versus Q4, 2011 with a 28% quarterly growth between Q3, 2012 and Q4, 2012.There are variations in data consumption patterns across geographies and maturity of markets. Continued from an earlier post – RIL’s 4G push and the disruptions that could happen there-off. The first disruption was the ability to create data hotspots with high speed WiFi through 4G Backhaul. The second disruption, is in terms of triple play services – and the game really looks close to the broadcast services that I had written about some time back. To that extent, RIL would look to cut into revenue space of cable companies. In one of my earlier posts, I had mentioned about how Telco operators could up-end both cable distribution and content management and RIL seems to be planning content exclusivity along with data-pipe ownership. (Now that is something even Apple hasn’t perfected). The triple play strategy of voice, data and video could be very effective in acquiring wallet share of the customer. By exploring the television and cable space, RIL was looking to tap another potential 100 million screens for its broadband services and drive the triple play offering. RIL as a broadcaster is geared up for media convergence and will deliver content to any new platform. RIL has been creating a walled garden for content, which will give new opportunities to VAS (value-added service) providers and open up space for new niche channels. With an eye on the larger pie, Reliance would bet on building data habit into Indian customer psyche mainstream. There are rumours about Rs.3500 tablets and data plans priced around Rs10 per gigabyte. With a mighty 4G backhaul, powered by 802.11n WiFi and data speeds upto 100mbps-1Gbps and Rs.10/GB cost of data, the traffic rates are bound to multiply. RIL is betting on this traffic surge to build its big push in Telecom. #: Assuming that RIL will find a way to muscle in VoIP regulation for Inland calls also. RIL does have that clout to make that possible. Why RIL’s push into 4G services could be the most disruptive effort in India’s Telecom history? As Reliance Industries (RIL) readies to launch 4G services in India, it is worth looking at the game plane for RIL – how it plans to disrupt the industry and the present Telecom business paradigm. While there is no launch date for Reliance 4G launch yet, it is expected that RIL will launch its 4G services in 4-7 metros by mid 2013 (3 years after it acquired 4G licences by acquiring Infotel). The 2300MHz 4G band in India is prohibitively costly for plain carpet area coverage and most of the operators are picking up traffic hotspots to put up their equipments and BTSs. Interestingly enough, RIL’s gameplan of riding on WiFi actually works on the contrary – it will create 30000 hotspots across selected metros which will let users access 4G-LTE network speeds on a WiFi framework. The cost of providing one to one terminal based solutions through a wireless route would have been extremely costly in terms of OPEX and CAPEX. However, RIL has turned this weakness into its strength going through the Fibre Optic route and a MiFi terminal. It also caters to a segmented strategy – SOHO, SME, HNI Homes, Retail, Enterprise etc. Therefore it makes WiFi the short area wireless standard. Going forward, in the future, RIL will ride on its fibre optic network coupled with Femtocells to increase coverage carpet area. Refer to the illustriation below for understanding of the MiFi zones and Femtocell solutions to cater to focussed carpet areas. The disruption here is that, by the use of WiFi, RIL will tap into every operator customer by providing a WiFi over-ride on the wireless services of competitors. A XYZ operator customer will also have RIL pre-paid data card which will allow him high speed WiFi in catchment areas- schools, colleges, restaurants, offices, airports, railway stations etc. The XYZ Operator services will only be used for low volume/low value services outside RIL hotspots. Inherently from a customer perspective, he uses bulk of his data/voice plans from only certain catchments (Office, College, Home etc). The service platform of RIL 4G will be device agnostic targeting both wired and unwired devices. Will 4G TV be the end of the Cable bundle? As of 2010, India has over 515 channels of which 150 are pay channels. According to Pioneer Investcorp, the Indian cable industry is worth 270 billion (US$5.39 billion) and is the third largest in the world after China and US. The number of TV homes in India grew from 120 million in 2007 to 148 million in 2011. Cable reaches 94 million homes with 88 million analog connections and 6 million digital ones, while DTH has commanded 41 million subscribers. Every year, 100 million Indian homes pay for a bundle of cable channels. Like any bundle, it’s hard to see exactly what they are paying for. That in effect is somewhat the point of bundling — to disguise the true cost of the constituent items. Most of the users end up paying more money than the total worth of TV time they are watching. Imagine the working couples in Mumbai or Delhi who watch 4/5 (at max 10 channels) for an hour or two in the evening after they get back home from work. They pay the same money to the cable provider/DTH provider even for value packs just because their total cost of entertainment consumed is less. They are effectively cross subsidizing entertainment value consumed by a large family where the TV runs through the day for the people at home. With advent of 4G and higher broadband access, content providers and TV providers have a unique opportunity to break down on the economics of TV viewership, make it more meaningful and interactive, focus on the right target segment of consumers (more band for the buck) and make users pay less (or pay more meaningfully) for the content they consumer. After all why should I pay for a Bollywood movie pack if all I am interested is in sports. In effect they can cut out content not required and cure the content consumed for much higher levels of viewership through many other personal devices such as Tablets or smartphones etc. Video streaming will eat away into TRPs as people would want to watch only their kind of programmes at their kind of times with mobility featured in. The Internet is ruthlessly efficient at stripping cross-subsidies and allowing content to shine on its own. The Internet gutted the music industry. Print journalism has been forced to innovate or die — or, sometimes, both simultaneously — in response to the Web. The question isn’t really if the 4G data and the economic of unbundling will visit the television industry but when. It does look like a fertile ground for TV service providers and Content providers. A melting pot for mergers and acquisitions. 4G- Can Telecom Operators count on 50% data revenue contribution for their business cases? Even when the base price for 2G is being debated and the 3G tariffs are registering a free fall, 4G services are supposed to be taking over as the revenue engines for Telcos riding on the data wave. However, a recent research report from PWC states that it is highly unlikely that data use revenues will grow from the current level of around 14 per cent of total revenue to 50 per cent by 2020. TRAI, while figuring out per unit 4G spectrum rates, had assumed that data services will contribute more than half of an operators’ revenues by 2020. Analysts and industry operators are now arguing that this basis of pricing spectrum is wrong. At present, non-voice revenues as a percentage of total revenues stand at 14 per cent, out of which pure data services contribute only 5 per cent and the rest comes from message-based services. PWC has a sound basis- Even in mature telecom markets such as Denmark, Italy and the US, the contribution of data services to revenue is only 19.6 per cent, 27.2 per cent and 33.20 per cent, respectively in 2010. In fact, not even Japan has 50 per cent data revenues as a proportion of total revenues today. Sometime this week, Mukesh Ambani put off the launch of RCom 4G services by an year. Even while Airtel has been quick to launch 4G, for all purposes this is a soft launch. RCom entry has been deferred because the markets are not matured yet. Lack of demand may also see two foreign operators — Augere Wireless (backed by France Telecom) and US chipmaker Qualcomm — quit the 4G data segment. So now the question that begs to be answered is given sluggish market maturity, lack of demand – and the fact that most mature telecom markets havent performed at 50% revenue contribution levels, was the industry APEX body – TRAI over setting its targets and the spectrum pricing? For those who invested in, the case of a break even seems a little distant already. Tagged with: 4G, Indian. Telecom, Roll out. With traditional revenue sources for the operators like voice and messaging at bottom levels, the subscriber churn, as a result of mobile number portability, it is quite natural that the operators are taking a safer route and betting on VAS as the next big opportunity to sustain and succeed in the market. According to PwC, the mobile VAS market in India has the potential to generate Rs.55,000 crore by 2015. As per V&D100-the annual survey of the Indian communications industry-the Indian cellular market for FY11 is estimated to be around Rs.102,230 crore, ie, $22.3 mn and this market is growing at the rate of 16.6%. Of this total amount, VAS or non-voice revenue for mobile operators contribute around 13%, which translates to Rs.13,026 crore. It is expected that the Indian VAS market is bound to increase to Rs.32,000 crore in FY15. All this will happen only when operators provide stable 3G and 4G network and quality of experience so that data services improve considerably. The Indian VAS market is also bound to grow as operators have already invested around ‘100,000 crore in terms of 3G and BWA auction, and they are presently in search of a series of killer applications that will help them recover their auction money. Not only this, they are also looking at killer applications that are less bandwidth consuming and can bring a large chunk of revenue. The launch of 3G services in India opened up a plethora of opportunities for VAS players. With 3G services, the operators will now be able to offer richer services such as mobile internet and video, as there is greater bandwidth available to deliver an enhanced service experience. While the operators will continue to offer pre-3G existing VAS, such as ringback tones, messaging, and infotainment services; there will be an opportunity to offer services that require more video or image based content, such as telemedicine, wireless teleconferencing, and e-learning. VAS will also play a critical role in bridging down the digital gap between urban and rural masses, with operators coming up with innovative offerings to suit customer demands in all regions. Of late, VAS has also helped in digitally empowering the masses as it continues to play a major role in m-governance and m-commerce. Offerings like medical facilities, an SMS away, or mandi prices for farmers on phone, have even made the government to take a keen interest in the development of VAS. Innovations such as location based services, mobile TV, m-wallet have given the best breed of personalized services on mobile devices. Market growth drivers on the supply side include declining ARPU, brand differentiation needs, and growing focus on entertainment-related content; demand-side drivers include the booming Indian economy, increasing user comfort with basic mobility services, personalization of content, devices, and cheaper handsets. From the early days of ‘Person-to-Person Short Message Service’ (P2P SMS), the industry is witnessing the growing portfolio of services including graphics/wallpapers downloads, ringtones and caller ringback tones (CRBT), SMS contests, and games. Telecom, especially wireless, was supposed to be India’s ticket to economic development. Most operators contend that the government is trying to extract too much from them. The top four firms for instance must have paid close to $15 billion over the last four years itself as revenue share, licence fee, service tax and spectrum charges. Industry watchers contend that if they (the government) tries and extracts more, it will only be counter-productive. One of the biggest obstacles faced by operators when it comes to breaking even is cost of spectrum (when you consider the rock bottom tariffs), especially when acquired through auctions. In India, spectrum is expensive, scarce and unpredictable. Those need to be changed for operators to be able to innovate around long-term investment plans. Doing this allows savvy operators to marry the most efficient technology to the spectrum they purchase. Naturally, they’ll pick one that’ll have maximum consumer value. A unified licence should mean an operator is free to offer whatever combination of technology [it] wants, even if that means a 2G plus LTE data card. The unified licence automatically takes care of revenue leakage. There is also a case for offering slightly preferential treatment to those operators whose licences got scrapped and are re-bidding, versus those that are completely new. Globally, it’s a well-accepted strategy among regulators to reserve blocks of spectrum for new entrants and provide them certain handicaps. But that is now a political question in India. Incumbents believe that subjectivity and artificial restriction on the number of bidders will only lead to market distortion. The long-term goal for the regulator must be to figure how to bring more spectrum for auction, more frequently. What is considered reasonable spectrum in most markets like the US and Russia for an operator is 15-20 MHz? That should actually be higher in India, given the size of our market. On the contrary Indian operators have to contend with 4X the number of consumers on networks working on fourth of the spectrum. Indian Telecom’s New Deal too will need the “Three Rs”—Relief for serious operators and poorly served consumers, Recovery of the sector’s vast potential and Reform in order to bring lasting transparency and fairness.If we don’t get it right this time, the next 10 years of Indian telecom will be like the last 10 years. This crisis really, never mind the cliché, is an opportunity.